The following article is taken from my book, Blue Smoke Risin' on the Mountain -- a beginner's guide to the mountain dulcimer, 2d edition, copyright 2008 Lee Cagle. The mountain dulcimer is a beautiful instrument, both visually and in its sound. Although its roots lie in the Appalachian Mountain region of the United States, it has captured the fascination of musicians across the globe. When the United States began to be settled by Europeans, the adventurers and pioneers brought their musical instruments with them from across the ocean. Can you imagine how important music must have been to these people for them to bring their instruments on the long, grueling ocean voyage, where space and possessions were very limited? When bringing the instrument was not possible, they brought the memory of their European instruments and built instruments after arriving in the New World, using native woods and materials. These courageous and musically stubborn forebearers brought fiddles, guitars, pianofortes, lutes, horn, accordians. And for all of the American ingenuity to which we lay claim, there are few instruments that we can claim as our own. 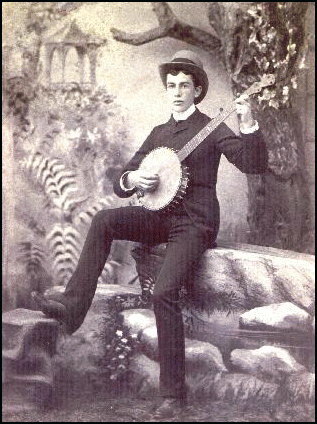 Based on African gourd instruments, African-Americans gave us the banjo which was used in the minstrel shows of the 1800s. That gift has become the backbone of bluegrass music and the Dixieland sound. In an effort to reach the masses, the autoharp was produced and sold through the Sears & Roebuck catalogue. This instrument allowed even the most inexperienced player to join in by pressing buttons to make chords while strumming across the strings. And the mountain dulcimer! No one knows the person who managed to develop the dulcimer in its current form. The mountain dulcimer combines features similar to the fretted zither, the German scheitholt, the Norwegian langeleik and Swedish hummel into the instrument that we play and love today. I am daily amazed at the thought and foresight in the design of this instrument. 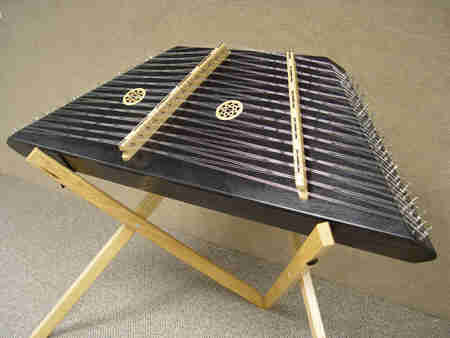 Traditionally, the mountain dulcimer was played only on the melody string. Therefore, the frets were partial frets placed under the melody string only and did not extend across the fretboard as they do today. The player many times used a wooden stick called a "noter" to fret. Also, prior to the widespread use of plastic picks, the dulcimer was often strummed with a turkey or goose feather. The bass and middle strings were not fretted. They were tuned to harmony notes and acted as drones behind the melody. 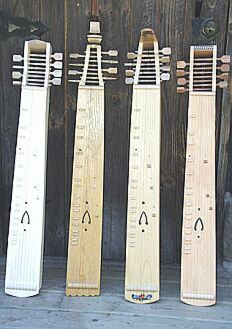 There have been many updates in the design of the dulcimer over the years. Shapes have changed from boxes to hourglass and teardrop shapes. Picks have replaced feathers. Frets now extend across the fretboard. Fingers have replaced wooden noters, and chording, rather than melody only, has become commonplace. 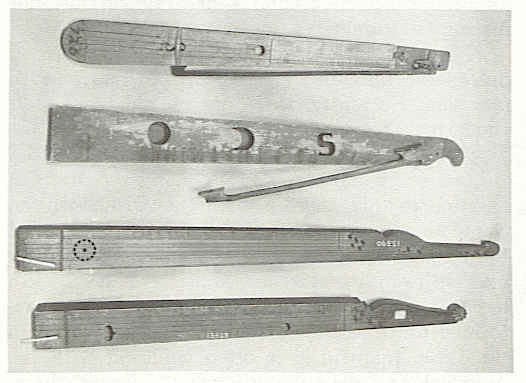 Also, early dulcimers did not have a 6 ½ fret which was not added until the 1970s. The addition of this fret allows today’s players to play two different scales — the Ionian scale and the Mixolydian scale — without re-tuning. Because many of the settlers of the early frontier (western Carolina and eastern Tennessee) were of English and Scots-Irish descent, many of the songs that we consider traditional mountain dulcimer songs are rooted in the English and Celtic tradition. The design of the dulcimer with its droning strings is reminiscent of the sounds of the bagpipe. Because it uses an open tuning, meaning that the strings harmonize even when no frets are being played, the mountain dulcimer is referred to as a "modal" instrument. The mountain dulcimer is not chromatic, i.e., it does not have all of the notes like a piano. For that reason, the dulcimer may have to be re-tuned in order to achieve certain sounds or to provide the player with desired notes or scales. 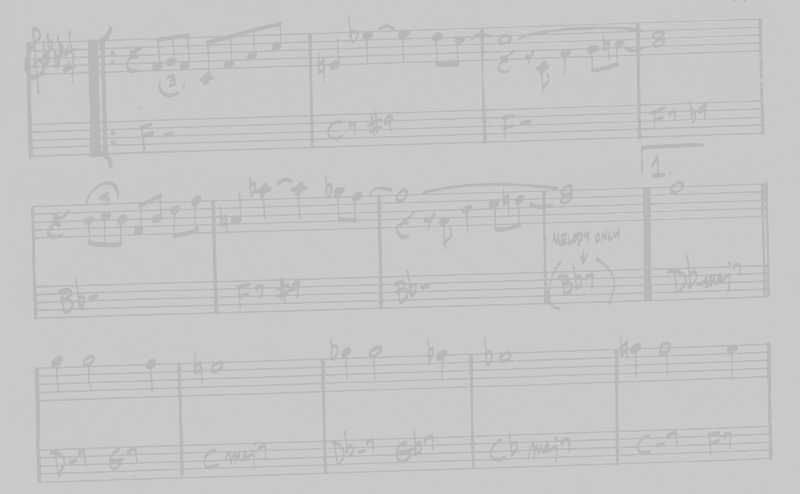 Those scales, with notes that are flatted or sharped at points outside of the standard major scale, are the "modal scales." Each modal scale is named for one of the seven modes of ancient Greece. Modes will be discussed more fully in the section on Modes and How They Apply to the Mountain Dulcimer. Folklorists and missionaries who traveled to the Appalachian region in the 1800s made note of the dulcimer in their journals and writings, but some remarked that it was or soon would be extinct. They were SO wrong! 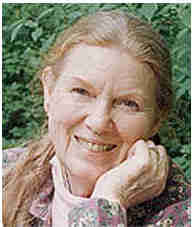 Jean Ritchie was born December 8, 1922, in Viper, Kentucky. Her family history is rooted in the folk music and ballads of the Appalachian mountains. During her college career and afterwards, she traveled and took with her the family dulcimer and her collection of folk songs. 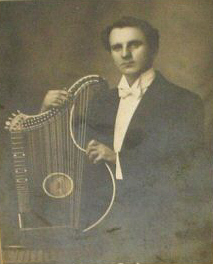 After marrying George Pickow and moving to New York, she continued to educate the public about dulcimer and folk music. The time was right for the dulcimer to take on a major part in the folk music movement of the 1950s and 1960s. Since that time, the building and playing of dulcimers has grown to almost every corner of the globe. 1. The instrument that is named in the Bible is not the mountain dulcimer. You may know that there is another instrument that is also called a dulcimer, but it is the hammered dulcimer. This instrument has its origins in the region around Persia and it the instrument mentioned in the Bible at Daniel 3:5 (KJV). But no matter the name, the sound is the same: sweet music. Resources: The books and writings of Jean Ritchie; Appalachian Dulcimer Traditions by Ralph Lee Smith; The Spirit of the Mountains by Emma Bell Miles; Jane Hicks Gentry by Betty Smith; the works and collections of Olive Dame Campbell and Cecil Sharp. For more on dulcimer history, click here to read an article by David Schnaufer. For more information, read on the development of country music, click here to read an article by Charles K. Wolfe. Click here for information on Hammered Dulcimer, Autoharp, Bowed Psaltery and Fretless Zither.